Looking for something creative and exciting to do with friends? Then check out A Painting Fiesta! It's a Paint Party where you can bring your own food and drinks, and in no time you'll be painting just like Picasso! 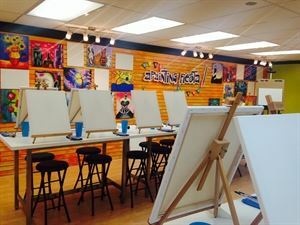 We specialize in Adult (BYOB) Paint Parties, Team Building Activities, Ladies Night Out, Kid Art Parties, After-School Art Classes, Day Camps and more! What are you waiting for? Book your very own Painting Fiesta Today! Call us today to inquire or reserve your party!